See the 'Planets, Comets and Asteroids' category winners of the Insight Investment Astronomy Photographer of the Year 2017 competition. People knew about the planets Mercury, Venus, Mars, Jupiter and Saturn long before the invention of telescopes. They noticed five points of light that, at first glance, resembled stars. However, closer observation revealed that they did not twinkle in the same way that stars did, and they moved in the sky with each passing night. Astrophotographers must overcome a series of challenges if they are to successfully capture images of our nearest neighbours. As with everything else in the sky, they need to follow their target as it moves east to the west, due to the Earth’s rotation. The planets themselves are also spinning. This is not such a big problem for those with slow rotational speeds, such as Venus and Mars, but Jupiter spins very rapidly and takes just under ten hours to make one complete rotation. This image shows the changing face of the planet Venus as it grew from 86.6% illuminated and 11.9 arcseconds in diameter on the 25 September 2016, to 1& illuminated and 59.3 arcseconds in diameter six months later. All the images were taken with the same setup, so the changing size of Venus, as it approached the point between us and the Sun, is really apparent. The larger crescent phases were shot using Infrared and ultraviolet filters to capture cloud features. The other images, where the apparent diameter is small or the crescent is thin, were taken using only an Infrared pass filter. All were stacked in Autostakkert and sharpened in Registax. Final processing was performed in Photoshop CC. 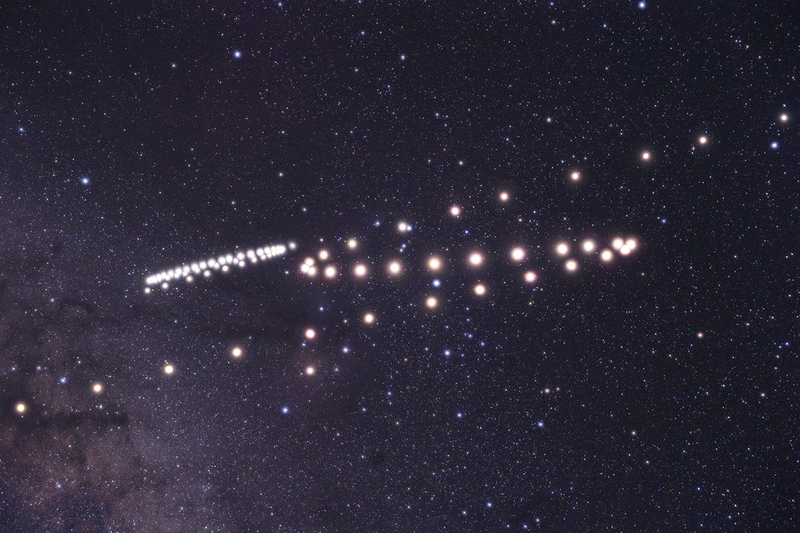 "Since I started astrophotography, I have made several time-lapse composite pictures of planets wandering in the sky. 2016 was special because Mars and Saturn spent the year close to each other, north of Antares in Scorpius. Mars was in opposition on 21–22 May, while Saturn’s own opposition came just 12 days later, on 2–3 June. Even better, they traced their respective retrograde loops simultaneously next to each other. 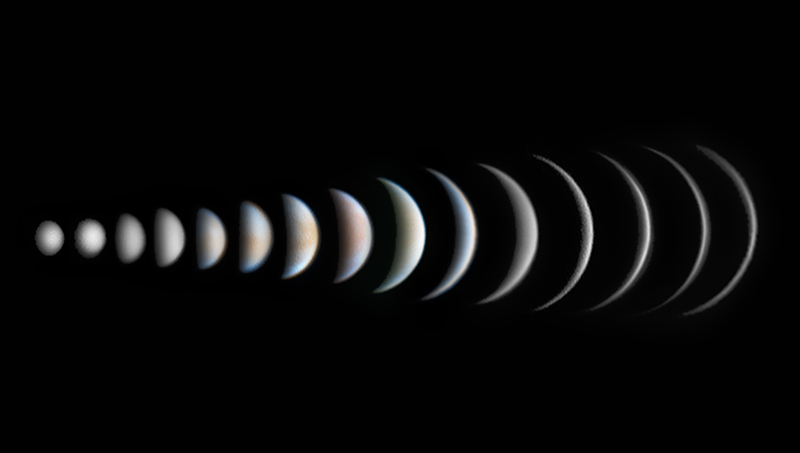 I photographed the planets on 46 different dates over 11 months, roughly once per week. For the master image, I used the picture I took in the morning of 9 March 2016 from eastern Halmahera, Indonesia, due to the excellent conditions and lack of light pollution or haze. I registered the rest of the shots on to this master, which were mostly from Bursa, Turkey. The exposures of other nights ranged from 6 to 30 seconds according to the changing conditions of the sky, the effects of moonlight and light pollution." "On 31 October 2016, Near Earth Asteroid 164121 (2003 YT1) made a close encounter with Earth at 3 million miles. This Apollo asteroid with an orbital period of 427 days was discovered by the Catalina Sky Survey on 18 December 2003. At 2.30 a.m. on 2 November 2016, the 11th-magnitude asteroid passed by bright Polaris (2nd magnitude) by only 4.6 arcminutes (less than 0.1 degrees). I made my first attempt at imaging the asteroid with a camera on a fixed tripod, controlled by Astrophotography Tool software. The asteroid moved so fast I could see it moving on the live screen. It created a photographic trail near Polaris. 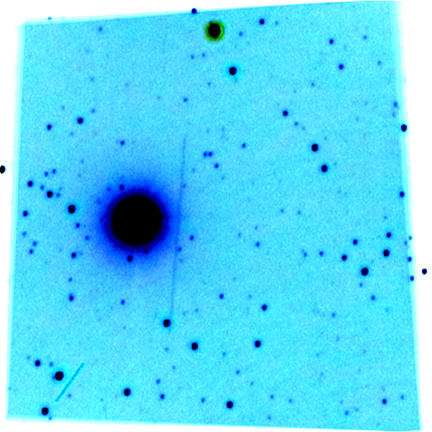 The negative image is a stack of 56 cropped images created using PIPP and Deep Sky Stacker software. The image was processed with IrfanView and Photoshop for scientific content rather than cosmetic appearance." The North Star, Polaris, is by far the most prominent body in this image, but the real object of interest is the faint streak passing just to the side of it. In this view of the asteroid 164121 (2003 YT1)on its 2016 close approach to the Earth, the photographer has kept the camera steady on the stars so that the asteroid draws out a trail as it moves across the frame. The image is presented as a negative, with bright objects appearing dark and vice versa, while an artificial blue and cyan colour palette helps to make the detail really stand out.